This is a list of Satellite Television Channels in Telugu language ( spoken in the Indian states of Andhra Pradesh and Telangana ) broadcasting at least throughout Andhra Pradesh and Telangana states. DD Saptagiri - GEC from Doordharshan for Andhra Pradesh. DD Yadagiri - GEC from Doordharshan for Telangana. ETV Telugu - owned by ETV Network. Gemini TV - owned by Sun TV Network. Maa TV - owned by STAR TV. Zee Telugu - owned by ZEE Network. Maa Gold - owned by STAR TV. Studio One - owned by Narne Network. Vissa TV - owned by Raj Television. Gemini Movies - 24Hrs Telugu Movie Channel from Gemini TV. Maa Movies - 24Hrs Telugu Movie Channel from Maa TV. Cine21 - 24Hrs Telugu movie channel from Cinema TV. Gemini Music - 24Hrs Telugu Music Channel from Gemini TV. Maa Music - 24Hrs Telugu Music Channel from Maa TV. Raj Musix Telugu - 24Hrs Telugu Music Channel from Raj Telesivion. Gemini Life - 24Hrs Classical/Old Music channel from Gemini TV. Vanitha TV - Women's Channel from Rachana Television Pvt Ltd..
Gemini Comedy - 24Hrs Telugu Comedy Entertainment Channel from Gemini TV. Kushi TV - Telugu Kids Channel from Gemini TV. Cartoon Network - with Telugu Audio feed. Discovery Kids - with Telugu Audio feed. Disney Channel - with Telugu Audio feed. Disney XD - with Telugu Audio feed. Disney Junior - with Telugu Audio feed. Hungama TV - with Telugu Audio feed. Nick - with Telugu Audio feed. Xtra TV - 24Hrs Film news and gossips channel. Tollywood TV - 24Hrs Film news and gossips channel. ETV Andhra Pradesh - News Channel from ETV Network. 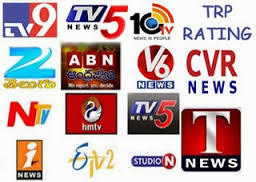 TV9 - News Channel from Associated Broadcasting Company. Gemini News - News Channel from Gemini TV. TV5 News - News Channel from Sherya Broadcasting Pvt Ltd.
NTV - News Channel from Rachana Television Pvt Ltd. Studio N News - News Channel from Narne Network. Sakshi TV - News Channel from Sakhi NewsPaper. ABN Andhra Jyothi- News channel from Andhra Jyothi NewsPaper. HMTV - 24 Hrs News Channel from Hyderabad Media House. 6TV - News Channel from LCGC Broadcasting. Raj News Telugu - News Channel from Raj Television. V6 News - 24 Hrs News Channel from Visaka Industries Media Group. ETV Telangana - News Channel from ETV Network. T News - 24 Hrs News Channel from Telangana Broadcasting Company Network. Jai Telangana TV - News Channel from Associated Broadcasting Company. 6TV Telangana - News Channel from LCGC Broadcasting. TNN - 24 Hrs News Channel from Telangana News Network. Owned partly by Pasham Yadagiri and partly by KCR. Discovery Channel - with Telugu audio feed. History TV18 - with Telugu audio feed. National Geographic Channel - with Telugu audio feed. Sony Kix - sports channel with Telugu audio feed. Bhakti TV - Hindu devotional channel from NTV Group. Sri Venkateswara Bhakti Channel - Hindu devotional channel. OM - Hindu devotional channel from CVR Group. Subhavaartha TV - Christian devotional channel. Aradhana TV - Christian devotional channel. Rakshana TV - Christian devotional channel. Calvary TV - Christian devotional channel. Bible TV - Christian devotional channel. Ruju Margam TV- First Islamic channel in telugu. Hyderabad - Nursing Assistant , Computer Courses and Driving. aj ap Logo k leye Jazz TV link ly kr aya ho ..kuch mainay page pr nechy post main share kiye hwoy hain .or kuch new share kr raha hon jo k bhut say Logo ko nhi pata hai ..
సాటిలైట్ తెలుగు ఛానల్ వస్తే న మెయిల్ కు పంపగలరు .plz.